Greece finally has a deal. We don’t know if this is agreed upon in pure exhaustion after 17 hours of negotiations, but it’s something that involved total capitulation by Greece. It is even worse than the deal that Greece was getting earlier (before the referendum). they have to raise the sales tax, and cut pensions. Once this is done, the parliaments of Germany, Austria, Holland, Finland and others that previously opposed a deal will have to say okay to doing the bailout. Only then with the ESM actually even meet to discuss the bailout specifics. Meanwhile Tsipras has to again negotiate for bridge financing to pay the ECB for what is due on July 20th. There’s something strange going on. The Greek people just refused a lower level of austerity (in the earlier deal offer) and now they will be told to accept much more austerity and humiliation? For an alternative that must actually sound good in comparison — the Grexit and the printing of a new drachma? I think this is very very strange, and Tsipras has got to have more cards up his sleeve. This doesn’t happen to a person who has played his cards well, and I think there’s much more to this. It’s very strange to see someone go down so badly. As much as he’s probably pissed off the Greek people by agreeing to such a rancid deal, the idea could be to get sympathy from the rest of the world. You simply do not humiliate a country like this, not in peacetime negotiations. If the sympathy card works, then belligerence will be forthcoming within a day or two, and Tsipras will show a different face in a while. 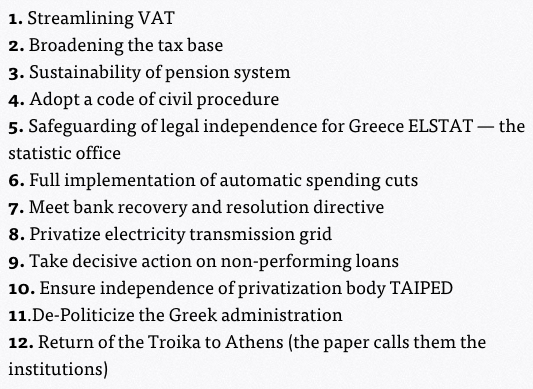 Think about it: what has emerged is that the Eurozone wants to permanently cripple Greece. This much is obvious. And if that is clear, then the only way to get out of this situation is to say: “I wanted to see what they really wanted from us. We are going to exit, because even half of this is unacceptable to us”. However, this is looking increasingly unlikely. Greece sees a revolt either within Syriza or with the people, and the government resigns rather than sign such a deal. The resulting situation will be to have a temporary government whose composition will determine if it will sign anything or not. Tsipras is able to convince the rest of Syriza and Greece that this is indeed the best thing to happen, and the deal is done. Then in a few weeks and months, we see little tiny revolts all along the way and Greek keeps falling into a situation where eventually this whole deal collapses anyhow. Tsipras revolts against Europe and says Grexit anyhow. Big drama happens but over the next few months things smoothen out. There is literally no case for steady growth for the country. The debt is unsustainable so nothing will change anything unless there is a debt reduction – and that will happen, whether forcibly or voluntarily. The question is when: and they’ve kicked the can down the road for four years already. We see this as a terrible precedent for international relations. Yes, there has been a deal, but it is so one sided, that we are fairly sure residents in Portugal, Spain, Ireland and Italy will be horrified that this could happen to them. Germany is probably betting that public memory is short, and it might just turn out that it is not.